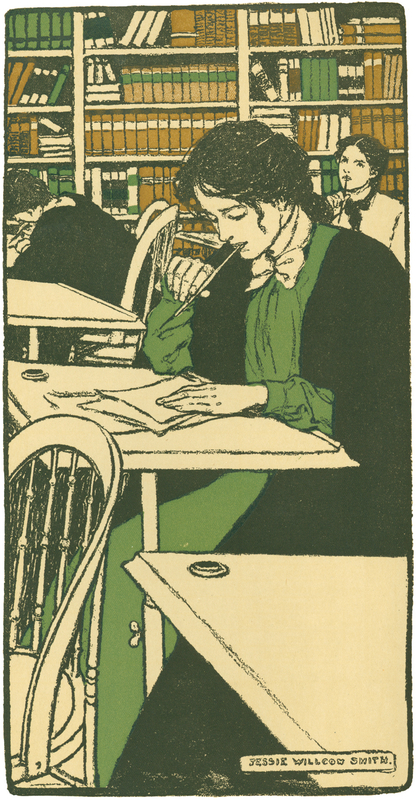 This image, taken from the 1902 Bryn Mawr College calendar, was created by Philadelphia based artists Jessie Willcox Smith and Elizabeth Shippen Green. Duration (number of class periods): 2 Periods with a student deliberation during the second class. Objectives: This lesson is designed for both male and female students to understand the discrimination and obstacles women faced in trying to achieve higher education in the late 19th and early 20th century. Also, this activity places an emphasis on using both primary and secondary sources in the classroom as a way to enhance the students’ understanding of the lesson. 8.1. U.B: Evaluate the interpretation of historical events and sources, considering the use of fact versus opinion, multiple perspectives, and cause and effect relationships. 8.3. U.A: Compare the role groups and individuals played in the social, political, cultural, and economic development of the U.S. Essential Question: How did the establishment of Bryn Mawr College impact women’s rights to higher education circa 1890-1920? Moreover, how does this relate to the social and political context of the time? *NOTE: Although this lesson is designed for students to use computers to complete the assignment, it is adaptable for schools without the appropriate technology. Teachers should print out any hard copies they may need before class. If teachers plan to use computers to do the lesson online, reservations with the library, computer lab, or laptop rentals should be in order. This lesson is flexible for either a study on Women’s History, US History, Women in Education, or Important Women in History. While extensive knowledge on the subject is not necessary, students should have some background knowledge on the gender discrimination that stunted the social, academic, and economic advancement of women.